The Newest Rant: Film Friday, "Wreck-It Ralph"
I watched Wreck-It Ralph with my girlfriend this week to help take her mind off of her being sick, and because we both had been wanting to see it. Therefore, I rented it from a nearby Redbox kiosk and before long we were enjoying this quite-good movie. Despite it feeling strongly like a Pixar-made production, this is actually all Disney's doing, with some of the people who worked on the film having done stuff for Pixar before. I say it feels like a Pixar movie because it has the tropes of a world that has to "keep character" when people are around (See: "Toy Story") and characters who struggle with accepting who they are but in the end are happy (See: Finding Nemo) while also learning a valuable lesson about teamwork (See: "A Bug's Life). The resemblance to Pixar is by no means a bad thing, however. 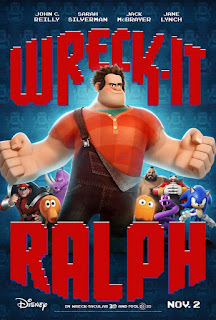 The observed similarity is a compliment as "Wreck-It Ralph," is very charming and good fun. While at times the movie may seem to move a little slowly, it is still effective at grabbing attention, from our protagonist Ralph--voiced quite well by John C Reily--who just wants to be accepted and maybe not a bad guy anymore, to Sergeant Calhoun who comes off as delightfully harsh thanks to Jane Lynch the whole proceeding is very well-voiced and engaging. As Ralph goes from Calhoun's space-marine game to a kart-racer where Sarah Silverman's character, Vanellope Von Schweetz, desperately wants to get to race someday, we see all kinds of interesting conflict between the characters as well as hints of romance between others.Plus the cameos, oh the cameos! If you are a fan of video-games, both new and old, you will be positively giddy at the appearance of various characters both famous and lesser-known from throughout the history of games. Sonic the Hedgehog pops in, the orange ghost from "Pac-Man" (also known as Clyde) gets some screen-time, and I'm pretty sure I saw the guy from "Joust" riding by on his ostrich-creature at one point. While the main games in the movie are fictional, having characters such as Q*Bert appear give these fake games a sense of real-ness. One notable absence is Mario, as he is mentioned at one point and Bowser is in the film but we never actually see Mario. I remember reading in an interview the film's creators felt such a character was a big-enough name that more than a brief-appearance would be needed to do the fellow justice (or Disney didn't want to shell out enough money for Mario, one of the stories is probably the case), so perhaps we will see him in a sequel. 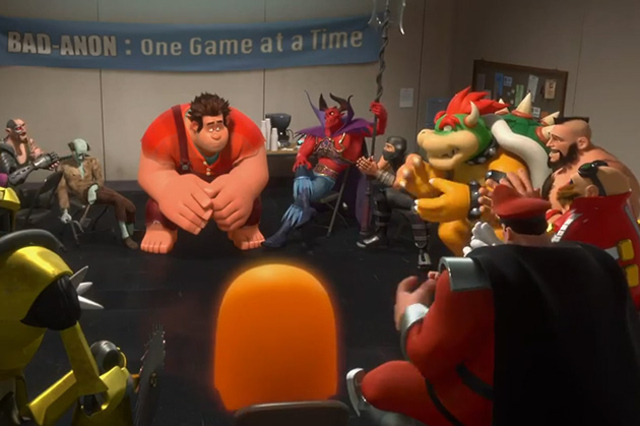 "Wreck-It Ralph" is quite an enjoyable flick, full of references to other video-games while also making viewers care about the original characters. 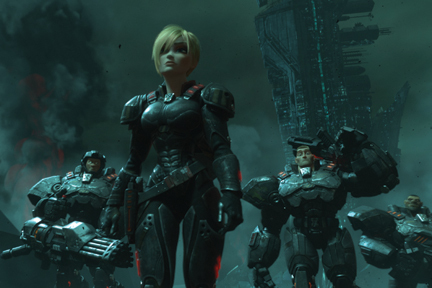 While the film sometimes would go a little slower than I wanted, it otherwise is a stellar piece of film-making great for adults, children, people who like video-games, people who know nothing about video-games, and basically anyone who wants to enjoy a good story.